Take your group on a spin around the Kingdom. 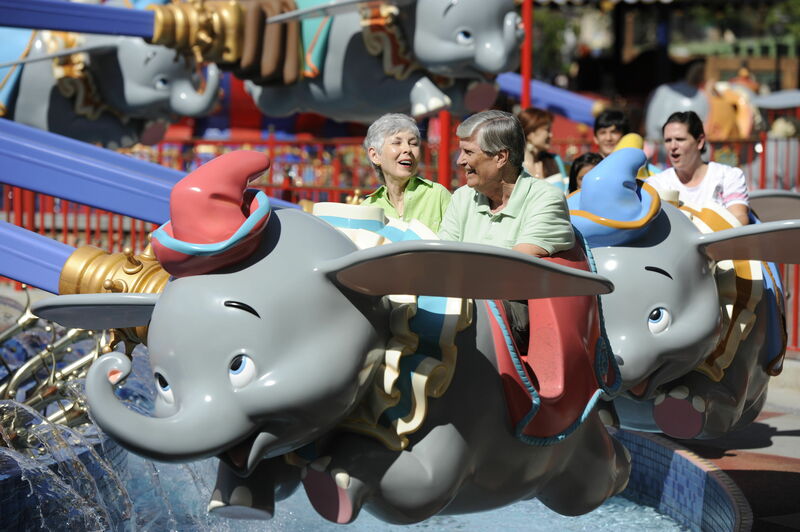 There’s no easier way to plan a togethering vacation — what small family reunions are sometimes called — than at a Disney theme park with grandparents in tow. Let’s look at some recent stats. We know that more than 37% of grandparents who travel, have traveled with their grandchildren on one or more leisure trips within the past year. According to D.K. Shifflet, 27% of all overnight leisure travel in 2014 was as a multigenerational group. These numbers make multigenerational travel a big trend. There are lots of options if you’re looking for a place to take a big group. But the Walt Disney Company hasn’t been in the family entertainment business for nearly 50 years without learning something, and perhaps that is why Orlando’s Walt Disney World (WDW) has been cited in various surveys as the Number 1 “dream” family reunion destination. There’s also few places that can cater to both toddlers and grandparents while still appealing to teenagers and weary parents alike. Disney properties have varied activities which are well executed and appropriately planned. This means you won’t find action-packed Indiana Jones stunt shows next to the Dumbo ride. But Disney also knows how to make just about any ride or experience magical for anyone. 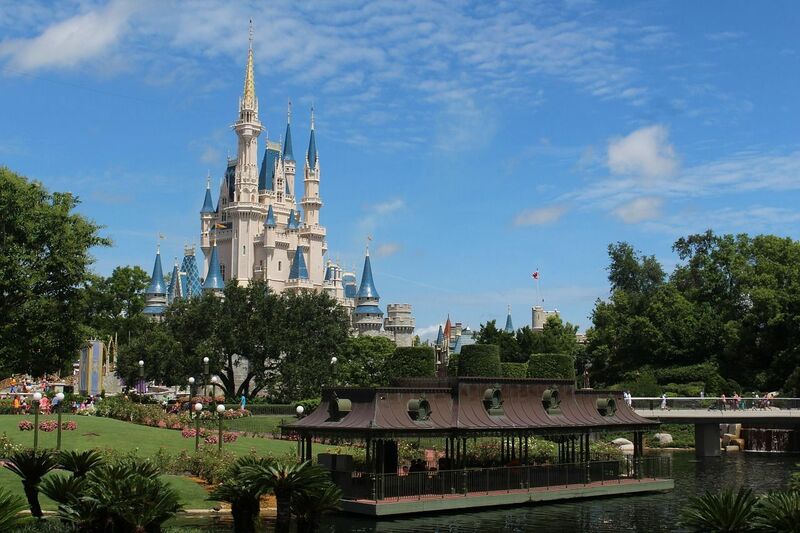 To be inspired by some togethering reunion ideas, check out Disney’s Magic Your Way Vacation Packages. Their staff of experts can help coordinate accommodations, activities and dining for your group, keeping everyone’s needs and interests in mind. Traveling with a small family, let alone a huge group, is no easy feat. Simplify your vacation by using the MagicBand system before you ever leave your house. This “smart” wristband comes with your WDW hotel bookings, and can hold all your travel information, hotel room key, reservations for rides, restaurants and more. Bands for every family member are sent in the mail two weeks before your departure. Booking a free MagicalExpress ride from the airport to the resort enables you to check your luggage curbside from your home airport, and watch it magically appear in your resort hotel room up to three hours after you arrive. You don’t have to use the luggage service, but it sure comes in handy when traveling with toddlers and a gaggle of relatives. MagicBands can also be used to unlock your hotel room and pay for park purchases. Ask your resort’s concierge to hook-up your MagicBand to your credit card and pick a private pin number. Go to the park and pay for meals, treats and souvenirs by scanning your band at the register and inputting your pin. With so much to see and so little time, WDW has developed other technologies to ease your theme park phobias. Fastpass Plus, Disney’s reserve-a-ride system, enables you to avoid lines by choosing a return time slot and scanning your MagicBand or Magic card at the kiosks set up outside most attractions. One fun perk — when you scan the MagicBands, it tells the Cast Members your name. Bonus if it’s your birthday. You’ll get a “Happy Birthday” all over the parks and warm smiles. To save even more time, download the My Disney Experience Mobile App to check wait times and adjust your Fastpass on the go. Guests get three picks per day at one park, and if you use them all, you can pick up a fourth option as it’s available. It’s worth checking out the wait times on the app first. During slower periods like after Labor Day and the first week of December, rides like “It’s a Small World” are often slow. Just get in line for the 5 or 10-minute wait and save your Fastpass option for the more crowded character meet-and-greets and more popular rides like the new family-friendly Seven Dwarfs Mine Train rollercoaster. Especially useful for group travel, the Disney PhotoPass service can connect right to your MagicBands and store photos taken by the parks’ professional photographers. Purchase the service and leave your camera in the hotel room. Next, ask any park photographer to snap a photo and afterwards they’ll scan your band. The photos go right to your account to view, download or purchase prints. You can even add other users to the account so everyone can get in on the action and pick and choose their favorites. As noted, there’s lots to do outside the theme parks. Disney has created two fantastic world-class water parks -– the snow-themed Blizzard Beach and the tropical-island-style Typhoon Lagoon -– which are very cool(ing) but probably not worth the extra fee unless you have at least a half-day and plenty of warm weather to enjoy them. Beyond the theme parks, you’ll find five top-quality golf courses that reserve tee times and shuttle service for on-site WDW hotel guests; rental equipment for power boating, sailing, wakeboarding, bicycling, tennis and other sports at the various hotels. The WDW on-site hotels use local Orlando childcare services to provide in-room babysitting, a worthwhile investment for some quality adult time. At night, most of the WDW hotels also offer a group kids camp for ages 5+ so that adults can try local clubs and nightlife. Downtown Disney has an attractive branch of Wolfgang Puck’s where all family members can dine together, and a purpose-built theatre for “La Nouba,” an incredibly original combination of gymnastics, dance and music from Cirque du Soleil. Some families may not want to buy tickets at Broadway prices for exhausted little ones, but I guarantee a performance by this Montreal-based avant garde circus will astonish spectators of all ages. In general, Orlando, Florida is a good reunion destination because air service is frequent and available from almost every corner of the globe. With so much competition for the market, airfares are reasonable year-round. Additionally, the on-site WDW hotels provide more than 31,000 hotel rooms at rates ranging from $85/N for value resort hotels on up to over $300. A key advantage of staying at a WDW Resort is the ability to enter a designated park earlier than the public each day with extra Magic Hours. The perk is extended for guests of Walt Disney World Resort hotels, Swan and Dolphin Hotels, Shades of Green Resort and Hilton Orlando Resort on Hotel Plaza Blvd. Check their online calendar for daily extended times, as hours are subject to change. Want an example? At the time this was written, extra magic hours extended from 9pm to 11pm at Epcot. If your reunion group wants to linger over breakfast, then this perk may not hold much value; however, if you’re traveling with early-bird preschoolers, choosing a resort within the enormous parks will give you a head start on a typically short day. Try to book a resort on the monorail line (buses, ferries and trams shuttle guests around at a much slower rate) so you’ll be able to return there for regular naps. And remember, though the WDW hotels may cost more than others outside the park, you’ll save on a rental car. Accommodations will largely depend on how many people in your group will stay in each room. To book accommodations for more than five people, call 407/939-7725 for assistance. To get an idea of where to start, Disney’s Art of Animation Resort near Animal Kingdom sleeps up to 6 guests per suite with separate bedroom pull-out sofas, two bathrooms and kitchenette. Each resort has its own perks, personality and vibe. The turn of the century style Boardwalk Inn had a nostalgic vibe complete with a juggler performing live in the lobby. Suites had kitchens, a fold-out couch in the living room and separate bedroom. While most convenient to Epcot and Hollywood Studios, you can still grab a shuttle to get to the Magic Kingdom in less than half-an-hour. 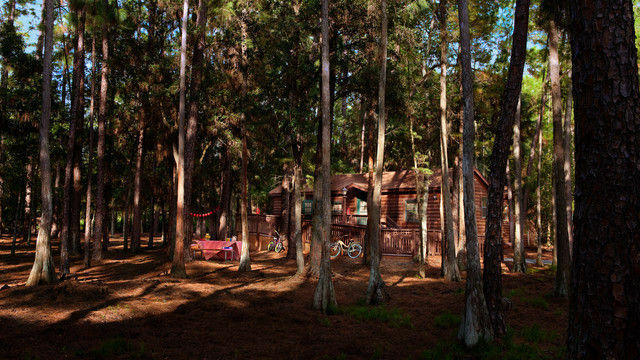 But if you have little kids and grandparents who tire from the over-stimulation and need to decompress, consider Fort Wilderness to stay at the Lodge, park an RV, pitch a tent or rent a cabin. Evenings are filled with roasting marshmallows, free Disney films, wagon rides and the promise for horseback riding in the morning. The Wilderness Cabins sleep up to six guests with over 500 square-feet of living, dining and sleep area complete with private patio and BBQ grill. The maid service will even take care of your dishes so you can just enjoy dinner at the picnic table with the family. Big groups should look at the Deluxe Villa Resort hotels with one and two-bedroom villas sleeping up to nine guests at select locations. Full kitchens, laundry and whirlpool tub are all available. The Boardwalk Villas sleeps up to nine, as well as Disney’s Animal Kingdom Villas Jambo House. If you prefer not to stay at an on-site WDW resort, the Nickelodeon Family Suites Hotel, with its themed two to four-bedroom units and enormous zero entry swimming pools with water features, is a wonderful alternative and very good value. Of course, Orlando boasts many family-friendly hotels — here’s our pick of the Top 10 Kid Friendly Places to Stay. One of the biggest assets at WDW is the sheer variety of recreation. Magic Kingdom, source of the magic for most young children, boasts strolling character figures who give out autographs, hugs and pose for pictures. A melody of Disney songs swells to a fireworks spectacular during evenings at the Magic Kingdom. Keep an eye out for Tinker Bell as she soars over the park during the show. At Epcot, in addition to the World Showcase pavilions hosted by 11 countries, exhibits such as Test Track and the Mission Space simulator ride have the right combination of cutting edge technology and thrills to engage adults and older children. Epcot recently announced plans to replace the Maelstrom ride in Norway with a Frozen princess-themed ride by 2016. Some may be sad to see the 26-year old ride go, but it’s part of Epcot’s effort to steer some focus towards kids. Disney’s Hollywood Studios is the park’s answer to Universal Studios Florida, but with family fare, stunt shows and rides. Strolling characters, 3D movies and gentle rides are based on Buzz Lightyear and other heroes from “Toy Story,” “Frozen”, “Star Wars,” “Disney Junior,” and other shows and movies. Come back in the evening for Fantasmic, a 30-minute fireworks and water show with characters and sounds from favorites like “Beauty and the Beast”, “The Little Mermaid,” “Aladdin” and “Peter Pan”. One of Disney’s newer theme parks, Animal Kingdom, boasts a dazzling array of African animals now living comfortably in central Florida, strolling outside the deluxe Animal Kingdom Lodge and easily tolerating the action-packed Kilimanjaro Safari tour. Within this park’s elaborately carved, 14-story Tree of Life is a theater showing an imaginative, interactive 3D film based on “A Bug’s Life” that will give adults the creepy-crawlies, too. Especially popular here and appreciated by all ages, no matter how fearful, is the log-flume-style Kali River Rapids ride. When you’re in charge of reunion planning, everyone will be grateful for your frugality. Don’t be shy about checking with AAA to see what discounts your local club in offering at the Orlando resorts and theme parks; Mousesavers.com and Undercover Tourist are other websites devoted to finding the best bargains at the parks. No matter where you purchase tickets, you will want the advice of the experts at Walt Disney World. They have a variety of vacation planning tools and a helpful Moms Panel online, with this guide to Family Celebrations and Reunions reserved for tips for reunion and multigenerational vacation planners. The experienced reunion planners at Disney suggest you start by finalizing who is coming to the reunion, and make notes on their ages and any special needs. (By the way, Disney has a lot of programs for the-mobility impaired or other handicaps). Timing is everything. You can begin to select a date by focusing on one of the many special events or seasonal festivals being celebrated at WDW, or discuss the family’s schedule and, when dates are set, decide how long everyone will stay. All of this information should be circulated back through your group so that everyone can research which accommodations they prefer. Once hotels are booked, you can select your WDW admissions passes. Although the economical Park Hopper Plus tickets give access to all four theme parks–Magic Kingdom park, Epcot, Disney’s Animal Kingdom park and Disney’s Hollywood Studios, most families won’t have the stamina to accomplish this. Especially if you’re traveling in the hot and humid Florida summer, discuss how much time you can be out in the sun, and how much time you’d like to spend together at your hotel, or at the beach, touring the Everglades or taking in another attraction. When it comes to the WDW theme parks, plan your stay so that no more than two theme parks are scheduled on any given day, or you’ll waste a lot of time traveling between them. Ready? Set? Start doing your research. Each season, WDW puts together a number of packages incorporating theme park admission with on-site hotels and other perks that make for an unforgettable –- dare we say “magical” -– gathering. Hi, I used to be researching the web & I discovered your web site. Keep up the superb work. nice story. Keep on posting.